125 hp motor soft starter, 90 kW three phase 220v, 380v, 460v, 660v AC motor starter. Model GS2-090 (220v), GS3-090 (380v), GS4-090 (460v), GS6-090 (660v). Tips: Choose Soft Starter or VFD? 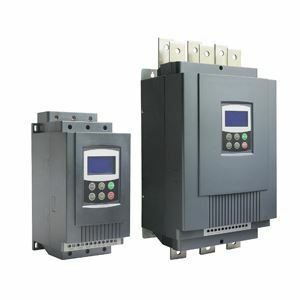 When you can choose a variable frequency drive (VFD) to start an induction motor, it kinds of expensive compared to a conventional soft starter if your application running at full speed all the time and there is no need for flow or speed control. A motor soft starter achieves almost the same current limit and reduced water hammer effects by controlling just the voltage to the induction motor. Many soft starters have a contactor that bypasses the thyristor bridge once the motor gets to required speed.